Lemke offers the most comprehensive and systematic account of Michel Foucault's work on power and government from 1970 until his death in 1984. He convincingly argues, using material that has only partly been translated into English, that Foucault's concern with ethics and forms of subjectivation is always already integrated into his political concerns and his analytics of power. The book also shows how the concept of government was taken up in different lines of research in France before it gave rise to "governmentality studies" in the Anglophone world. 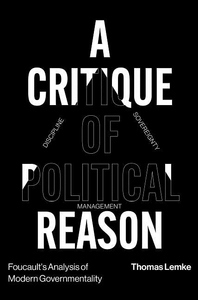 A Critique of Political Reason provides a clear and well-structured exposition that is theoretically challenging but also accessible for a wider audience. Thus, the book can beread both as an original examination of Foucault's concept of government and as a general introduction to his "genealogy of power."